Nowadays, many of users have been enjoying the android games on their PC. This could be possible only by android emulators. To play games, there is no need to have android phones as all can be done with the help of emulators if once installed on your PC. Basically, the android emulator is a platform made for PC & laptop which can assist in running android games on PC. You can find a lot of android emulators when you go for in search of them, so this makes the task far more daunting. 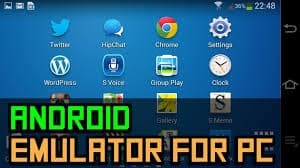 You need to find out the best android emulator which means that if not selected properly then it can really slow down the processing of your computer. So, in order to solve this issue, we have come forward and compiled a few lists of best android emulators for PC – window 7/8/8.1/10 which you can use to run android apps or games on the computer. So, let’s proceed to have good knowledge of android emulators. We have compiled list of Top Free Android Emulators along with paid and premium android emulators. List is as follows. It is the newest and interesting emulators. It is basically designed for real power & its feature too points to the same. It is loaded with some silent features such as it comes pre-rooted along play store installed. It is quite fast. One more thing it does not allows you to configure your keyboard as a controller. It is an emulator which assists you in running all sort of android apps or games on your PC with ease. It is available at free of cost. If you system has low specs then it is much better to use blue stacks software as it can work with low specs system and you can enjoy high-end games on your system. The recommended specification for Bluestacks is 2 GB RAM. But there is a myth which is expanded among the people that it cannot be installed if your system has less than 2GB RAM. The recommended specification for a system to install bluestacks on the system is 2 GB RAM. If you try to install blue stacks on the system having only 1 GB RAM then you might face the hanging issue. But it is not true. This is one of the best Free Android Emulators. It is one of its own kind android emulators. This app supports those features which are not even supported by any other android emulators such as use your phones as a remote control while playing games, ARM support and so on. This app is very much alike Genymotion as both require VirtualBox to be installed on the system. It is one of the unique android emulators. One best thing about this app is that it completely runs using the windows kernel. It is handy to use as well as light- weight and even it does not require any external VirtualBox support. But you need to take care of one thing is that the directory path wherein you install this app must not contain spaces. It is another advanced android emulator for PC. It is also considered as another best alternative of Bluestacks. This app is loaded with some of the advanced features such as OpenGL and hardware acceleration support. It has been built on the X86 architecture, thereby much faster as compared to Bluestacks. This app is mainly built for testing android apps. You can install apps using command prompt and also by drag & drop. This app is not much popular as another android emulator. It is really quite good. You can enjoy best experience of your android on your PC at free of cost. This app has been developed by a programming service oriented company. It depends on virtual box. You can get the full experience of android on your PC with the help of this app. It supports multi-touch or zooms functionality as well. It is very easy to use. It also offers GPS and application compatibility. It is not much popular as well as works fine. This app is not having special features but it simple to download and install on your computer. It supports window XP/7 and presents your list of android apps which you can download later. You can install this app even your system have low RAM. It is not a perfect android emulator. Even there are some minor graphical faults. But you can some of the android apps on your PC with the help of this emulator. It is another android emulator for playing android games on your PC. In order to have the best experience in gaming, this app offers you some additional utilities & support for computer keyboard & mouse. One thing you shall be surprised that it does not come with additional software. Overall, its performance is satisfactory. Now you guys have come aware of all the softwares which have compiled for you. These android emulators are best apps and loaded with a lot of features. Some of these android emulators are not very popular but their performance is not let you down. You need to select now best apps which could satisfy your needs. You guys can now enjoy your best android games or apps which you are not enabled to do owing not having Smartphone in your hand. By android emulators, you can do all this in one way. You just need to install on your computer and now you can enjoy your favorite one. With the help of this tutorial Run Android on Windows 10 Tablet. For you, we have compiled a few lists of android emulators so that you can judge what is best for your PC and what unique features they carry. Although these presented android emulators have some limitations but the overall performance of these apps is very good. So try to explore the information of these android emulators before installing it on your computer. And enjoy the best experience of your android games on your computer. Now select your favorite games and enjoy the one with best Android emulators for PC.